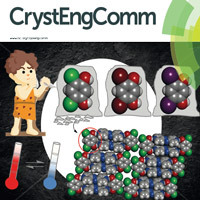 Groeneman and students' paper on thermal expansion earned the cover story for the peer-reviewed journal CrystEngComm. Research by Ryan Groeneman, professor in the Department of Biological Sciences in Webster University's College of Arts & Sciences, and Webster University alumna Katie Kummer '14 (pursuing her PhD) earned a cover story for the peer-reviewed journal CrystEngComm. The paper is "Thermal expansion properties of three isostructural co-crystals composed of isosteric components: interplay between halogen and hydrogen bonds," by Kristin M. Hutchins, Katherine A. Kummer, Ryan H. Groeneman, Eric W. Reinheimer, Michael A. Sinnwell, Dale C. Swenson and Leonard R. MacGillivray. CrystEngComm is a peer-reviewed online-only scientific journal of the British royal society, publishing original research and review articles on all aspects of crystal engineering including properties, polymorphism, target materials, and crystalline nanomaterials. Separately, Groeneman and Webster student researchers Ben Ingenthron and Frank Verdu presented papers at the 51st Midwest American Chemical Society in Manhattan, Kansas. Their papers were "Exploiting Polyfluorophenyl Phenyl Interactions to Achieve a Series of Quantitative Cross - Photodimerizations in the Solid State" by B.J. Ingenthron, R.H. Groeneman, M.A. Sinnwell, and L.R. MacGillivray, and "Dry Vortex Grinding to Achieve Photoreactive Co-crystal based upon Non-conventional Hydrogen Bonds," by F.A. Verdu, R.H. Groeneman. Biological Sciences and related fields at Webster will get a boost with the opening of the $44 million Interdisciplinary Science Building in fall 2017. In 2016 Webster University was awarded more than $1 million in grants from the National Institutes of Health (NIH) and the National Science Foundation (NSF) to support faculty research and to provide scholarships for students transferring to Webster in the Biological Sciences. Learn more about programs offered through the Department of Biological Sciences at Webster.